A dog no-one wanted is saved from drowning by a homeless man. 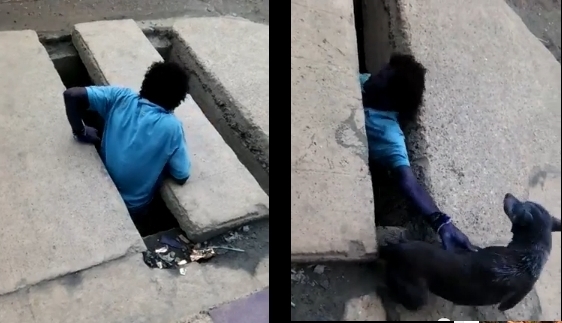 A homeless man from Cartagena, Colombia, witnessed when a stray dog fell into an uncovered sewer drain, and didn’t hesitate to jump after the pet to save the dog’s life. Thanks to this man’s heroic actions, the dog was saved. According to El Universal, the city had recently hired Pacaribe to clean the sewers in La Esperanza neighborhood, however, after the job was completed, the metal caps that cover and secure the sewer openings were not placed back and cement planks were left behind instead. The problem is that these covers leave an open gap wide enough for a pet, child, or adult person – like our hero rescuer – to easily fall down into the drain. It was about 8:30 a.m. when the stray didn’t perceive the danger ahead, and as he walked down the street, fell into the sewer. The dog had no way to get out. Without human intervention, the pet would have drown trapped inside the drain. Luckily, the unidentified homeless man jumped into action and saved the dog.The hero man walked over to the open drain and lowered himself through the gap. In the video, recorded by a local, you can hear the homeless man say the stray dog wouldn’t bite. Just a few moments after the man goes into the drain, a scared dog is lifted out and placed back on street level. Once safe, the dog shakes off the dirty sewer water and reunites with another stray dog. The two of them then continue their path. The heroic man also emerges unharmed, but dirty from the sewer. Responses to "Homeless Heroic Man Saves Street Dog From Drowning"
It is always the poorest and most humble, the most generous. God bless that man. He is a beautiful Human. He is a credit to the human population. What a wonderful human being. I will keep him in my prayers and hope that he will get what he deserves for his kindness. Great guy with a golden heart! So heartwarming to see this man go down and save this dog and pray that God blesses him in all ways!